Dogs need mental stimulation just as much as they need physical exercise, and cognitive training games can be a fun way to sharpen your dog’s intelligence. There are many different ways to exercise your dog’s mental muscles, and by providing that exercise, you will help your dog have a happier, more fulfilling life. Cognitive training is brain training, solving puzzles and figuring out solutions to sharpen mental acuity. This helps dogs focus their energy into constructive activities, rather than a bored pet acting out such as causing damage, barking uncontrollably, or otherwise becoming destructive for lack of anything better to do. Cognitive training can also help alleviate anxiety, depression, and stress in dogs by providing a useful distraction that often has a treat, praise, or other reward when the dog successfully solves a problem or puzzle. Training games can also be used to slow down dogs that may eat too quickly, establish impulse control in hyperactive dogs, and help dogs adapt to new and changing situations that may otherwise be frightening or upsetting. There are many fun options for cognitive training. Every solution may not be best for every dog, depending on its size, temperament, and abilities, but there are options that will work for every pet. Treat Balls Hollow balls filled with treats such as kibble, bites of cheese, a frozen bit of yogurt, or a glob of peanut butter are easy cognitive games that will keep even the fussiest dog occupied as it tries to get the tasty reward. 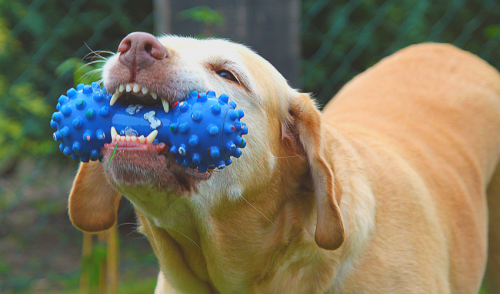 These toys also provide exercise as the dog pushes or nudges the toy to reorient it, and are also great for chewing exercises to promote healthy teeth and gums. Puzzle Trays Cognitive puzzles are specially designed with niches and compartments that dogs may need to nudge, twist, tap, remove, or spin to open and release hidden treats. Different tray shapes and sizes are available, and each one presents unique challenges. You can even make a simple puzzle tray by putting tennis balls into a cupcake pan with treats hidden under some of the balls for your dog to find. Hide-and-Seek A classic game of hide-and-seek is an easy cognitive game to play with your dog. You can hide a favorite toy for the dog to find, or even hide yourself as another player distracts the dog and keeps them holding steady until released to find you. This game can be played inside or outside, and you can use different players to increase the difficulty and challenge your dog. Wandering Walks Even a simple walk can be a fun cognitive training game for your dog. Instead of the same familiar route, choose a different path so your dog is exposed to new sights, sounds, and smells along the way. You can even let your dog take the lead and allow them to explore the turns and pathways that interest them the most. Toy Rotation A simple way to increase your dog’s cognitive training is to rotate toys regularly, removing more familiar toys and replacing them with new options. This will keep your dog’s interest and increase their enjoyment, and you can bring back old favorites occasionally to keep the rotation in progress. Obstacle Course Create an obstacle course for your dog for great physical and mental exercise. Hurdles, tunnels, balance beams, and different obstacles to go over, under, and through will create a fun puzzle while exercising different joints and muscles. Change the order of obstacles occasionally to keep the game new and exciting. Treasure Hunt Hide treats in different places for your dog to find, letting them use their nose to hunt down every tasty morsel. Place some treats in open, easy-to-find locations but be sneaky with others, such as putting them underneath a pillow or blanket, under a clear container, or otherwise providing an additional puzzle for your dog to solve. Shell Game You can have great fun with your dog when you play the classic shell game or cup game, hiding a ball or treat under one cup while you move around several other empty cups as distractions. Show your dog where you are hiding the treat or ball, and then mix up the cups several times to see if they can follow where it is. If they are successful, they get the reward. Trick Training Just learning a new trick can stimulate your dog’s mental muscles. Instead of only basic commands, add fun tricks into your dog’s training regimen, such as balancing a treat on their nose to improve patience and focus, catching a Frisbee to add coordination, or even unusual tricks such as jumping rope or dance routines for more advanced training and exercise. Name Game Naming your dog’s toys can be a fun way to increase their cognitive abilities. Teach your dog to fetch each toy by name, offering rewards for correct responses. Change the order you request toys each time you play to keep the game evolving to challenge your dog. It doesn’t have to be difficult to offer your dog fun cognitive training. As you work on more elaborate games and puzzles, not only will your dog’s intelligence and behavior improve, but you’ll strengthen your bond together as well. With so many training games to try, both you and your dog can enjoy years of challenging fun.